Is this an online class? It is a live interactive training by teleconference. Homework is expected to be completed several days before the class so the instructor can grade it and return it by the class date. In addition to presentations on theory, the results of the homework are the basis for each class discussion. Class participation is essential to get maximum benefit from this class. This class is for fluent speakers of Spanish. Location: Online – login information will be given to participants upon registration. Time: Online group sessions on Tuesdays from 5:30 to 7:00 pm Pacific time. Participants will also have scheduled 20-minute personal sessions with the instructor on a weekly basis. Teach grammar and spelling points in isolation. Many instructors have found this to be ineffective for heritage speakers. Assign writing assignments based on realistic communication expectations to be determined during the course, and work on the needs of the group as they come up. Instructors who work with this approach have been far more effective. This is the Gaucha approach. Helen Eby has been using this approach with small groups and individuals very effectively for the last five years. The writing activities chosen cover a variety of formal and informal interactions, ranging from the “tú” to the “usted” forms, and ranging from listing facts to giving advice or expressing hopes and dreams. Both grammar books have excellent explanations and exercises applicable to different issues. Helen Eby has written resource material available on the ¡Al rescate del español! site, and will write more material for this course. ¡Al rescate del español! is a team effort to provide a layman’s guide to good Spanish writing skills. Its main target audience is people writing text in Spanish for the public in the United States. Participants are expected to have a high level of Spanish oral language proficiency. They will be expected to participate in reading assignments to improve their writing skills. Bilingual employees and Certified and Qualified interpreters are welcome to take this course. As participants improve their reading and writing skills, they will grow in their ability to handle complex texts in the workplace, read material about medical and legal topics originally written in Spanish, and they will write with less grammar and spelling mistakes when required to do so at work. There is a discount for members of professional associations such as the American Translators Association, the Spanish Editors Association or other professional associations for interpreters, translators or copy editors. Helen Eby, owner of Gaucha Translations, is an ATA-certified translator (Spanish<>English). Helen started out in Argentina, where she graduated as a teacher of English and Spanish for grades 1 to 7. She has always been interested in researching and teaching, and has started training programs for medical interpreters in Oregon, an online training program for Spanish translators who are seeking to be certified. Writing skills are essential for translation, but this class is also for those who have other interests. 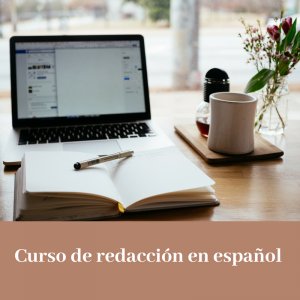 Many of the concepts that will be taught and much of the perspective of the course can be found in the blog ¡Al rescate del español! Daniela Guanipa is an ATA-certified translator (English>Spanish), and a certified Court Interpreter (English/Spanish) in the State of Indiana. Ever since completing her bachelor’s degree in International Studies in her native country, Venezuela, she has devoted her entire professional life to the art of communicating effectively and writing compelling copy in English, Spanish, and Portuguese. Her career as a linguist and trainer spans over 20 years and has amounted to a wide and rich professional experience. Daniela is an experienced educator who has taught Spanish at different levels—from beginners to advanced, to native Spanish-speakers—and settings, including private individuals, government and law enforcement agencies, judges, high-level executives, and corporate clients. In 2006 she became a trainer for the Indiana Certification Program, teaching sight translation to certification candidates. Ms. Guanipa is very active in the Translation and Interpreting (T&I) community and has served on the Board of her local ATA Chapter, the Association of Translators and Interpreters of Florida (ATIF), first as Secretary, and later as Vice-president, ATA’s renowned blog for new T&I professionals; a member of the Professional Development Committee of the ATA Spanish Language Division, and a reviewer of its quarterly newsletter, Intercambios. Helen and Daniela have been working together for years. They are both founding members of the Spanish Editors Association, the first and only association created in the United States to address the needs of editors working for the US-Spanish market. In addition, they are founding members and contributors of The Savvy Newcomer. Group sessions will be 90 minutes long. In these sessions, the group will discuss the assignments in general, and there will be group conversations about readings, literature, resources, challenges, and an orientation to the next assignment. Personal online appointments during weeks when there is no class to discuss their personal progress, as requested by students. The one-on-one sessions will allow participants to get individualized feedback and at the same time participate fully in the group sessions. Participants are expected to submit their written assignments to the instructors by Tuesday so they can be reviewed in time for the Thursday group class. September 12 1 Introducción. Cómo relatar una anécdota breve. Del bosquejo a la presentación: paso a paso. September 19 2 Elementos de corrección con ejemplos de la tarea entregada. ¿Cómo hace un escritor para comunicar una idea claramente en un párrafo? Elementos de corrección con ejemplos de la tarea entregada. October 17 5 Cómo escribir una oración. ¿Cómo cambian las palabras según su función en una oración específica? Aplicación del análisis morfológico al análisis sintáctico. November 7 6 Aplicación del análisis sintáctico y morfológico a la corrección de textos. November 14 7 Cómo se conectan las oraciones dentro de un párrafo para seguir el hilo. Cómo se conectan los párrafos de un texto. Cómo hacer un resumen. Práctica en clase. We are more than half way there! November 21 8 Puntos de vista en la redacción. Distintas formas de abordar un tema según su aplicación: un artículo periodístico, un mensaje de Facebook, un mensaje de correo electrónico, un cartel, una carta de queja, un texto de marketing. Cómo escribir instrucciones. Una receta, instrucciones para ejercicios, etc. December 5 9 Técnicas de investigación de temas con los que no estamos familiarizados. Tarea: redactar un texto sobre un tema novedoso para nosotros. December 12 10 Aplicación práctica a la vida laboral. Nuestra función como correctores, como redactores y nuestro trato con el cliente ante encargos complejos independientemente del tamaño. Ejemplos de la vida real de las instructoras. Thank you for participating in this class!